Not that many modelers know that ESCI not only did kits, but they also had a line of about 100 decal sheets, all in 1/72 scale. These small sheets carried a wealth of markings, for in addition to the usual subjects, there would be bonus decals that were usually unit badges or other bits. This sheet is quite typical of ESCI decals save for the fact that they are not yellowed. It seemed to me that these were made yellowed, but I guess not. One thing for sure is that they can be fairly brittle so care does need to be taken when using them. 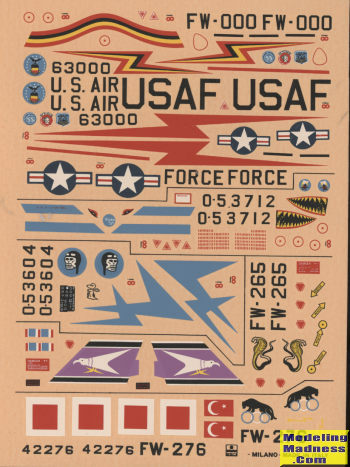 There is a wealth of 1/72 single seat F-100s on the market and really, you could use any of them for this sheet though there could be some differences in part width when it comes to things like tail bands so be aware of that. When this sheet was released, the best kit on the market was the ESCI version, and for many it still is. I'd rate the Italeri version next even with its additional canopy frame. The Hasegawa kit is pretty basic but has the right shape while the newest, from Trumpeter has an intake that is far too flat on the bottom. 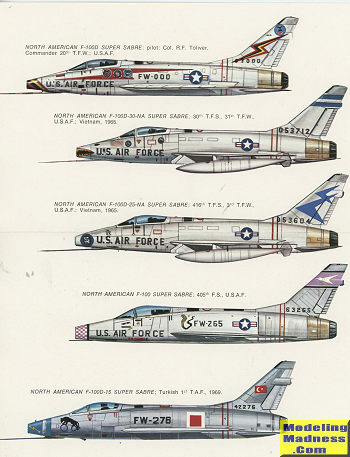 Five options are provided and judging from the profiles, all the USAF planes are painted aluminum with unpainted exhaust areas while the fifth option is overall unpainted metal. Most of these options have been done either in kit decals or other aftermarket sheets, but it is nice to have them all in one place. First up is a common scheme, that of Col. R. Toliver the wing commander of the 20th TFW. Next is a Vietnam era plane from the 30 TFS/31 TFW in 1965 with a shark mouth and many mission markings. Also from Vietnam in 1965 is a 416 TFS/3 TFW plane with a Snoopy nose art. The final USAF option is the purple trimmed 405 FS plane. The fifth option is a Turkish Air Force plane with the 1st TAF in 1969 bedecked in the older square insignia. ESCI sheets can suffer from registration issues and this one has a couple of markings that could benefit from replacing.